Government of India has made it mandatory to link over 100 crore mobile phone connections with Aadhaar by 6th of February, 2018. This is a great initiative by the government, by linking all mobile connections with Aadhaar, a caller can be easily identified and tracked thus a huge amount of fraud and terrorism activities can be reduced. What our government is looking for? Link all prepaid and postpaid mobile connections with Aadhaar via offline or online authentication. 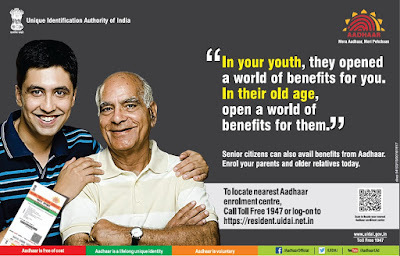 For offline, the subscriber has to personally visit the service provider's store and authenticate with his/her fingerprint (also known as biometric authentication) wherein online, the subscriber can do the online OTP based Aadhaar authentication. All service providers in India including Aircel, MTS, Airtel, Reliance, Idea, Tata and BSNL started the linking process, you would have already received text messages and emails from your service provider by now. Dear Customer, as per the Government of India directive, it is mandatory to verify your mobile number with Aadhaar. Please visit the nearest Airtel Store before 6-Feb-18 to complete the verification process. For store details, click www.airtel.in/store. Note, if you have taken your mobile connection recently and done e-KYC, you don't need to do this Aadhaar linking. All Reliance JIO customers are already e-KYC certified, they can skip the linking process. There are many articles available online explaining the offline process to link mobile connections with Aadhaar, so we don't want to repeat the steps here. You can link your mobile number with Aadhaar from the convenience of your home. Department of Telecommunications (DoT) had asked the telecom service providers to come up with a secure online linking process and the deadline for the proposed system is December 1, 2017. This would be mainly useful for those who cannot visit the stores in-person due to various reasons such as physical disability, health issues, traveling abroad etc. Also DoT had asked telecom service providers to come up with a IVR based linking system. The process would be simple, go to your service providers Aadhaar linking page and provide your phone number which needs to be linked with Aadhaar. An OTP will be generated and sent to your mobile, enter the OTP and your Aadhaar number, then proceed for online Aadhaar authentication. You will receive another OTP on the mobile number you have linked with Aadhaar database, enter the OTP and complete the transaction. On successful linking, you will receive a confirmation message and you are done! Repeat the steps for all the mobile connections you have before February 6th, else the service would stop without further notice. Also a humble request from Texient team to help those who do not have internet access and those who cannot visit the stores personally due to health issues or any such reasons. As per the Government directive, verifying your mobile number with Aadhaar is mandatory for all existing customers. Now verify your number sitting at home. Call 14546(tollfree). OTP will be sent to your number registered in Aadhaar database. If your Aadhaar belongs to a different state than your mobile number, For Postpaid Connection - Visit nearest Airtel Store. For Prepaid Connection - Visit your nearest retailer. Just dial this number from your Airtel number, you will receive an OTP on your Aadhaar linked mobile, input this OTP and you are done!